Genomenon has developed the most comprehensive database of gene fusion pairs found within the scientific literature. This complete literature catalogue for the 507 genes from the Illumina TruSight RNA Fusion Panel contains all known fusion pairs, with reference citations for every scholarly paper citing the chimeric genes. 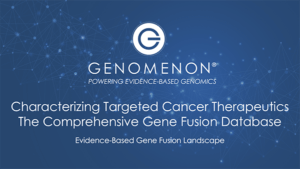 In this webinar, Genomenon’s CSO and co-founder Dr. Mark Kiel discusses how a Gene Fusion Database can be used to facilitate drug discovery and development. Gene fusion events are a leading cause of cancer, play a significant role in diagnosis, and can drive treatment decisions in an increasing number of cases. Possessing a comprehensive view of the research related to fusion genes can significantly accelerate the drug discovery and development process. This information allows researchers to find fusion pairs for any disease of interest, identify targeted treatment strategies, and refine fusion gene breakpoint analysis. Unfortunately, the diversity of gene pairs involved in fusion events can be overwhelming, and until now, there has been no comprehensive database of research citing gene fusions. In response to this need, the team at Genomenon has developed the most comprehensive database of gene fusion pairs found within the scientific literature. This complete literature catalogue for the 507 genes from the Illumina TruSight RNA Fusion Panel contains all known fusion pairs, with reference citations for every scholarly paper citing the chimeric genes. Question: Does Mastermind have all of the fusions observed in the TCGA dataset (or only fusions for driver genes)? Fusion Database is to annotate the TCGA dataset to determine which of the TCGA fusion events have actually been characterized in the literature previously to focus attention on the most meaningful fusions. Question: Are the fusions in your database annotated with the bioinformatics software used to call the fusion (in the case of RNAseq experiments and other genomic data analyses)? Answer: This annotation is not part of the first version of the Mastermind Fusion Database but your question will be taken into consideration for future versions. Question: How are therapeutic agents cross referenced in the database? Repurposed pharmaceuticals? Answer: This data is not in the first release, but will be available in future releases. Please contact us if you’re interested in therapeutic cross references. Question: How often is the database updated? Answer: The Fusion Database is updated on a monthly basis. Question: Can you query complex associations, such as variant-drug-outcome? It is important we can capture beneficial vs adverse effects of a drug on a variant. Answer: Future versions of the Fusion Database will be annotated by therapeutic compounds to identify which fusions are associated with which therapeutic. Question: To what level are the breakpoints characterized for the fusion partners? Answer: Fusion breakpoints are characterized at the exon/intron level. Question: Do you normalize variant representations across transcripts? exon numbering depends on transcript; so how do you ensure that you capture the proper transcript when parsing the papers? Is that something you have control on? Answer: If the transcript is mentioned in the article text, we use the transcript mentioned in the article; otherwise we use the transcript in which the variant is valid as described. Question: In slide 9 there was reference to scientific publication dated 2013 – so assuming the actual observations date back 7 – 10 years. How likely it is that new discovery since changed the conclusions? Answer: There are more than 400 novel fusion events described per year each of the last 3 years. Furthermore, there are new publications each year that further characterize previously described fusion events such as outcomes and response to therapy – either beneficial or adverse. The Fusion Database captures all of these references as they are published. Copyright © 2019 Genomenon® All rights reserved.